How can knowing your DNA sequence help you improve your quality of living? 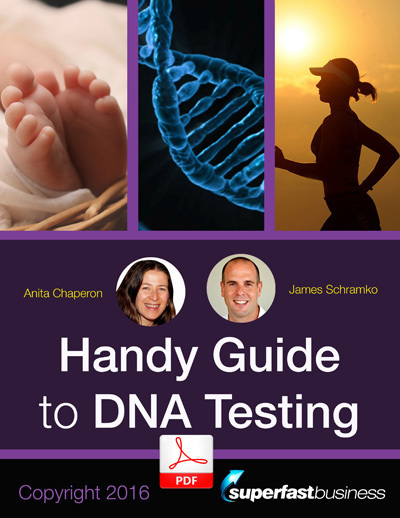 Find out in this episode as James Schramko and Anita Chaperon talk about some of the insights you can gain about yourself when you do the genetic testing. The chances are that most people listening to this episode don’t know about the advancements in DNA and how close it is to us as a consumer and how easily we can access data and why that’s actually important. For this episode, I’ve brought along my DNA mentor, Anita Chaperon. Welcome to the call. Anita: Good morning or good afternoon to you, and good morning to me. There you go. James: Yes, good morning to you, indeed. Now Anita, you’re from AnitaChaperon.com. I’ve had the pleasure of speaking with you on a very regular basis over the last few years. One of the things that you’ve been into well before I have is finding out about food, and nutrition, and getting stuck into this DNA puzzle and solving it. As a consequence, I actually spat into a jar and sent it off to a company. They analyzed my saliva sample, and then they sent me back all this information about who I am. They told me about the genetic makeup that’s pointed to my parents. Both my maternal and paternal lines showed me how much of a Caucasian I am and which regions I can be traced back to. I was also able to take the data and plug it into a number of other sites and get lots of information that relates to health. That was probably the most fascinating thing for me. Aside from the family thing, which was very, very interesting, and I’ll talk about some of the things I found out in this podcast. But firstly, how did you get interested in this and where did you discover it, Anita? Anita: First of all, thank you for having me on to talk about this because this is a personal passion of mine. I’m probably as excited as you are about it. It’s pretty much the way I see health and well-being going in the future because DNA sequencing provides you with a very bespoke formula for healing whatever might be worrying you in the moment. We’re not just talking about things like anything specific in terms of disease that you might have, but we’re talking about things like anxiety, lack of focus, being overweight, etc. This is like a channel that if it’s treated well, and if you approach it in the right way could provide you with a very shortcut to sorting these things out as opposed to taking five to 10 years to figure out what supplements to take, and why some of them are not working, or why some of them are working better, etc. So I’m really excited to be able to talk about this. James: It really does make sense. I heard people talking about blood type tests. I think Timothy Ferris was talking about some of this stuff, but I never really paid attention until I realized what it actually is. As soon as I came up with this idea of thinking about it as our hardware, it’s like, what hardware are we running with here? We talk a lot about software with mindset, and learning, and reading books, and adapting ourselves, and optimizing ourselves with goal setting and a lot of the other things we’ve talked about in previous episodes where we talked about morning power routine. A lot of that’s software work. I’m already at this phase in life, I’m in my mid-40’s now, where I wish I’d known this stuff 20 years ago. I wish that I had been able to get straight to the bottom line as to why I would have a neck pain or why I react differently to caffeine than some other people. But how did you actually discover this stuff? Anita: I’ve always been interested, as you mentioned, in the intro, I’ve always been interested in health and fitness, and I’ve always been interested in shortcutting that journey to optimizing yourself. We all go through journeys. If we dedicate ourselves, we have to get to the next stage. I had done a lot of background work on the software that you just mentioned, so I’ve gotten pretty good at managing my states of mind, etc. But there were still underlying stuff that was just buzzing underneath. I’ve always been an anxious person. So I naturally did a lot of detective work. We had the 23andMe DNA test quite a while ago for a different reason but never really looked into them and never saw the potential. And then it was just by chance that I read a book called Feel Good Nutrigenomics. It just makes so much sense. Anita: [Laughs] Well, it’s actually, all jokes aside, it’s not such a bad read, and I would suggest if you’re interested in this kind of stuff, this is probably the one place where you can go and get a good picture of why you should do genetic testing. I know you’re keen on covering that first, and there’s a few warnings that we need to issue if anybody’s thinking of doing the genetic testing because potentially, you could discover information that’s quite worrying. So I would say, it’s great to go ahead and do this. Do the 23andMe test because I think it’s the most popular place that you can go and get this stuff done. It’s quite inexpensive as well, and they ship to pretty much anywhere in the world. And basically, all it is is like you mentioned, you spit in a little, plastic tube, and you send it back to them. About four to six weeks later, you get your entire genome sequenced. So the few warnings that I would issue is, basically, you’ll find out a lot of interesting information about your ancestral trace or track record, etc., like you mentioned, but you also find out what I would call mid-level interesting trivia about yourself, like your earwax type for example, or like you mentioned, whether you’re faster or slower metabolizer of coffee. So that would kind of dictate how quickly you react to caffeine and so on. You’ll find out maybe why you react to alcohol differently from your buddies, etc. And then if you’re interested in the sports side of things, you could run your 23andMe results through the website called Athletigen, and they will spit out information that will dictate or that will show you basically whether you recover quickly from injuries, whether you’re prone to injuries more than the usual. So that will give you information that will allow you to protect yourself or choose your exercises well. For me, it was interesting to discover that I’ve always thought that I was an endurance runner, but apparently, I have a sprinter’s top muscle fibers, predominantly. That was interesting for me to discover because then I can go and train for sprinting. It kind of puts you in a different frame of mind when you understand that your hardware allows you to be good at something. James: It means you might not pursue, like you might not be trying to bang your head against the wall in something that is just physiologically opposed to what your natural predisposition is. It might explain why some people are, inverted commas, natural athletes or just designed correctly for the type of outlets they’re pursuing. Anita: Yeah. Obviously we can get into this topic at length, so I’m over simplifying things, but people like DNAfit for example, you’ve mentioned them a few times, and I know you’re speaking to somebody from there. They use this data, and they’ve been using it for years to design training programs for athletes or Olympic athletes. So it’s quite valuable information because they can optimize the training program. So if you’re into that type of stuff, it’s definitely worth running your data through them and getting that information because it will just, like I said in the beginning, it will shortcut your journey, and it will get you better results. It will teach you how to treat your hardware. And then talking about hardware, James as you mentioned, one of the biggest warnings that I’m keen on putting out there is that this is literally just your hardware. This is some information about what you’ve been given by nature, but you can’t take it verbatim. You have to understand that the thing that matters the most is actually what they call epigenetics, which is your environment, how you think about things, how you perceive your lifestyle or the challenges that come your way. Getting your genes sequenced and getting an understanding of what your mutations are and where the defects are is only one miniscule part of it. Pretty much, we have a very small understanding of the genes that are connected to any disease. The stuff that we do understand, we understand them in isolation. There’s very few connections that we can actually make in context. So we understand that if you have a genetic mutation in one gene, you take, let’s say vitamin B12, and it speeds up that pathway. But we don’t know how it affects the entire body as a whole. So go and sequence your gene is what I’m saying, but find a reliable professional to work with who understand how things are going to be affected down the line and who can tell you more importantly how you can live better, so you can have those genes expressed much better. I don’t know if I’m explaining this clearly, so I’m going to ask you to say if this makes any sense. James: Yes, I’ve been speaking to a few different people since I unlocked this, and I’m starting to understand that there are different interpretations of the DNA, and there are different outlets where you can plugin the main strand, and that some of the portals that give you extra data are constantly updating based on sample sizes, and some of the data comes from, for example when you do a DNA test with companies like 23andMe, they’re going to ask you for an optional survey and then they’re checking things like your history for health. I think they start profiling what types of patterns they’re seeing from people who have the same DNA. Is that how it works? Anita: Yes, that’s exactly how it works. Basically, they’re progressively connecting the dots, and they rely on the user data to fill in gaps, etc. I guess the whole takeaway from that is go and sequence your gene, but don’t take it as a sentence basically. It’s not written in the stars that if for example, you have more chance of contracting Alzheimer’s later on in life, it doesn’t mean that it’s definitely going to happen. It really depends on your lifestyle. James: Yeah. And the data is going to change. The more people that do this, the more it’s going to refine over time. And then of course, as scientists discover what causes things or how to prevent stuff, then they’ll be able to update the advice if they would come along with it. James: But I found some really interesting things, for example, that with my surname being Schramko, I’ve always sort of grown up thinking I must be quite Eastern-European in my background because my grandfather came from there. It turns out though that I’m mostly English, and Irish, and French, and German. Now my dad is starting to trace the family tree a little bit more, and he’s found some history in that French region. So I’ve got a little bit of Viking in me as well. Probably almost the least amount of Caucasian I had was that Eastern-European segment. So it’s kind of changed the way that I think about my heritage a little bit. I think I’m 50 percent British according to this. I’m really quite strong in that area. That means that I would lean more towards my grandparents, and great grandparents, and great, great grandparents on that side of the family to figure out who we are as a family. The other things that were really interesting when I started looking at the health aspects were apparently I’ve got some worrier gene, which means that I might concentrate better and make less mistakes, that I like checklists. A lot of people have said to me, “Oh James, you’re a machine,” or “You’re very systemized.” Maybe my natural predisposition is that I’m so concerned about that that I tend to tick my boxes more than someone else perhaps. A couple of other things there: it said maybe I’m allergic to peanuts, and that I don’t process B12 or folate as well as other people. I’m like missing the gene, or it’s only 50 percent effective compared to regular people. So what would I do knowing all these things? Anita: Well yeah, that’s the million-dollar question. If you’re like me, you’d go, and you’d dive in, and research it until the cows come home. But a lot of the people would not have that patience, and it’s quite a new field, and most of the experts that are out there are also readily admitting that they don’t know everything. I would say start with the end in mind. You just go and look at all these interesting information and maybe it will provide a few answers for why you’re doing things or why you’ve been doing things in life the way you’ve been doing them, which is fascinating. But then also, decide what your priorities are healthwise. What do I want to solve first, second and third? And then go and find a professional that’s experienced in that section. Just recently, very exciting news, actually last night, I got an email from one of the leading experts in methylation. Methylation is, for those of you who don’t know this, and I’m only simplifying, methylation is the method by which your body takes in nutrients and creates the vitamins and the hormones, etc., and the enzymes that it needs to be operate. So for example, you’ll eat a bit of broccoli, and your body will create some folate out of it, and use it to create tissues, well, not tissues for your nose but body tissues, skin tissue, eye tissue, stomach lining tissue, etc. So methylation is pretty important as well as detoxing. So those are the two pathways you’re going to hear mostly about basically when you start researching this online. So the great news that we’ve got last night, and again I’m going to say this with a bit of a caveat, because I haven’t had a lot of time to research it, but the guy that is coming out with this new tool is pretty reliable, he’s been around for a very long time, and he’s very hell-bent on treating this the right way, meaning not sensationalizing the information about DNA. So basically, he’s come up with a report that you can run your data, your 23andMe data, you can run it through his report, and he’s promising results that are actionable, meaning he only focuses on the mutations that we know what to do about, which shortcuts the entire journey quite a lot. And then he gives you recommendations for potential supplements that might benefit you. But then, it’s still the onus is you need to go and find a professional that you can work with, because, and I know it’s such a short time to try and cover the entirety of this topic, but the one thing that you’ve got to be very aware of is reports that give you specific recommendations. You know, take B12, or take folate, or take this or that. It’s not a one size fits all, the whole point of genetic testing is to be bespoke, and a lot of the information out there will give you generic, supplemental type of advice. And the thing is that some of them can be quite dangerous if taken in large doses. James: Well, I think it’s just like working with a professional. It’s like if you present yourself to a gym, and even if they did an upfront diagnosis of what you are right now, you wouldn’t start walking around the gym trying to solve your own fitness challenge, learning the equipment yourself, or you know, make your own routine. Like they might say, well you’ve got too much body fat, or you’re weak in your muscle. You don’t just grow and prescribe yourself a fitness regime, you get a professional. Or if you don’t have enough money, and you read a book about finances, you still should probably get some help from a coach or an accountant, and not try and take it on yourself. So I think that it’s a great reminder that this is just bringing new light. For me, it was just shining a light in a dark room and saying, oh, that’s where we’re starting with. And it’s the beginning of the journey, not the end. James: And we should talk about what are the basic steps, because really in an introductory podcast episode like this, where we’re just sort of bringing this maybe to a more mainstream market, maybe someone’s heard this a few times and it hasn’t really clicked. If you are listening to this, and you haven’t already done a DNA test, where do you recommend someone goes? Anita: Well, the steps are pretty straightforward. First of all, you need to go to 23andMe, and order your test kit. They’ll send it through to your address, and you spit in the tube, you send it back to them, you wait between four and six weeks, and they sequence your DNA in an online interface. So you’ll be asked to register your kit, create a password and username, and then once your results are ready, they’ll email you, you can go and review your data, like you mentioned. They run like a basic report on your ancestral kind of pathway, and then also, they do a few basic interpretations of your mutations. So once you get your 23andMe results, you can export your raw data file, which comes out as a zipped up text file, and you can run this data through, I would suggest, there are two websites that I would really bother with, and both of those are free. The one is Athletigen. Anita: Yes. And that will give you your details about the way the way your body is wired in terms of sports and athletic performance. And then the other place that I would run my report through is Genetic Genie. And it will give you two reports. One is the methylation report, and then the other one is your detox report. And those are really the two most actionable kind of things that you should look at in terms of getting results. It’s basically the most bang for your buck. James: And do you have any advisors or professionals or websites people could go to to start getting help to interpret their results and to get a little more help on prescribing solutions? You mentioned a new one that’s just become available. Is that something that we can share? Anita: Yes, definitely. And this is a paid report thing that you can run, but it’s pretty inexpensive. It’s called Stratagene, and it’s $45, and you get pretty much the most interpretable kind of data that I’ve seen online so far. James: Great. And just to put this in context, even 23andMe is not that expensive, considering the information that it delivers. It’s probably about $147 or thereabouts. James: The other thing is, you can actually now synchronize the data from there to some of these family tree finding software. So if you’ve got a parent, or a grandparent, or you’re the person in your household doing your family tree, this is going to save you a little bit of time. Because it found five or six hundred of my relatives had already done this report, and it knows this because of the DNA. And it shows me cousins and relatives, and you can actually contact them if you want. If you were trying to patch together some family tree for whatever reason, it might fast-track that process. Anita: Yeah, absolutely. There’s that part of it. I’m not very talkative about that, because personally, it doesn’t bother me. But definitely there’ll be people out there that absolutely love this stuff, and it will just shortcut the journey. Absolutely. James: Excellent. So what are the next steps that we would do once we’ve got the report, we’ve plugged it into some of these free sites, and then maybe we’ve gone for a paid option where we can get some professional guidance? What sort of changes did you experience when you went through this process? Anita: Well, for me, the biggest answer has been again fine-tuning, but I’ve always been an anxious person, and I discovered that I have a few mutations in my methylation pathway, which explains why I’m constantly anxious. It’s not that I’m mentally weak or don’t have the willpower to fix myself. It’s basically in my genes, and it’s expressing itself. So now I’m taking supplementation and literally with one supplement that I’m taking, my entire brain has changed. I mean, obviously in a good way. If you think about it in terms of taking the journey, I’ve been with an integrative practitioner of a different kind, not one that uses genetics. I’ve been working with them for six and a half years before this, and they couldn’t find an answer to my anxiety. James: That’s a wonderful outcome. And in my case, I had years’ worth of back and neck pain, and it was driving me crazy. I would go to chiropractors, and they’d snap me around, and bend me into shape, and really never did anything. I had massages once a week, it didn’t really work. It was so excruciating, at some point, I went and presented to the doctor and they did an MRI scan, and they said, “Oh, you’ve got osteophytes on your neck and your joints.” Like basically, I’ve got arthritis. Anyway, did the 23andMe report, plugged it into these various sites, comes back, it says I’ve got a very high chance of osteoarthritis. And it also said I might be prone to baldness, and I know that’s true as well. But what I was interested in is, you know a lot of the other things I haven’t yet found, it’s brought them to light as a potential area for me to be aware of, if I were keen to develop the next phase of understanding my body. Especially that peanut allergy potential thing. I mean that’s something that I could really test by removing them from my diet, which I’d already started doing after you were telling me how nasty some of those nuts can be. Anita: Well, that’s a very good point, and if I can just intervene very quickly, for example, there’s a gene that deals with what we call histamines, and histamines are very tightly linked to any food allergies or intolerances. And also, obviously, hay fever, and pet allergies, and all that stuff. And just knowing that you’ve got this, if you have a mutation in that gene, explains a lot of things, and it allows you to protect yourself from highly histaminic foods like what we’ve spoken about before. Obviously, this is getting into a little bit more detail, but I had a very severe allergic reaction to a tuna a couple of years back that I actually had to go to the emergency room for. Anita: And I didn’t know why that had happened to me. And when I did my genetic test, it shows that there’s something like six genetic mutations that are linked to histamine buildup in your body. And it shows that five of them, I have mutations in. So you know, for me to keep away from highly histaminic foods will improve my quality of life a million times over. And then for example, for Andre, it shows that he’s got one of those genes wrong in the histamine thing. But that happens to be the one gene that is linked to hay fever. So he suffers from hay fever. James: Yeah, he does sneeze sometimes. Can genetic testing help doctors? Anita: And I don’t suffer from hay fever, but I’ve got everything else wrong. So it’s kind of this kind of data that just provides so many answers, and if you know what you’re trying to solve, this just shortcuts the guesswork, and the journey, and obviously, the money that you’re going to spend in going to doctors and tests you’re going to do and all that stuff. James: That’s the part that makes sense. It’s like, how hard is it going to be for a regular doctor when you go to the doctor’s office, and you present with some symptoms? The amount of tests they have to do, the amount of guesswork that’s going on, this could really help them if you could pass it on. I can’t imagine we’re far away from the point where it would be recommended by general practice doctors at some point because it would greatly assist them, too. Anita: Yeah. And it’s exactly about how you live your life and even the things you believe or don’t believe and how you perceive every single challenge in your life, etc. That’s the most effective kind of thing that will influence over your genetic expression. So if you start them early in life, you give them a much bigger chance for improving themselves and having quality of life later on. Everything through mental focus, how much they enjoy life, and how happy they are, and obviously, physical health as well. So that’s why this is so exciting. James: Right. So just in summary here, why we’d be interested in DNA sample, because we get to find out who we are a little bit more, even though it’s in the early phases and the data’s still going to be completed. It gets us a starting point. What we’re talking about here is literally spitting into a jar, sending it off, and getting the results back. It’s not very expensive, no where near as much as you might think. So that’s how you do it. When you get the data back, you start plugging it into a few different sites. So just a recap, we would got to 23andMe.com, to get the core analysis, and then we can go to other sites like Athletigen and Genetic Genie to interpret it in more detail. If we want to get someone to help us, we could go to Stratagene.com. There’ll be more data and more emerging information on this topic. That’s basically where we’ve come to. We’ve also issued a warning and a disclaimer that you might not like the information you get. It may not be completely accurate, and you most definitely have to be extremely careful about how you execute based on the information once you get your report back. I think it would be good for us to round out this episode with any final passionate thoughts or comments you have, Anita, that someone should know as they rush off to order their kit and get going down this path, and then of course, we’ll probably get a couple of questions where this podcast is published on SuperFastBusiness. So look out for the episode that’s called, Who Are You? You’ll find it on SuperFastBusiness.com/blog. You can search the blog, it’s very searchable. And you can ask Anita a question if you happen to be listening to this on iTunes. By the way, if you like this show, and you have noticed the lack of advertisements or any sort of wishy-washy fluffy parts, go ahead and give it a ratings in the iTunes store. That would be a wonderful way to acknowledge the generous time that Anita has put to sharing this information with us. So Anita, give us some closing passion. Anita: Well, you basically owe it to yourself. If you spend your life building a business, and bringing up a family, and achieving stuff materially or otherwise, like you were talking about the software before, if you’re really passionate about this, you owe it to yourself to go and do this test as well because it will give you extra data that nobody else would know about you. And then even if you go to normal doctors visits, you can use this information to empower you and to also protect you from things that might potentially be harmful to you and that you don’t necessarily need to expose yourself to. And it’s such an easy thing to do, basically, and we’ve given you the pathway in terms of what your next step should be. So go and do it, basically. James: Thank you, Anita, great to have you back again. By the way, if you’re interested in all the other stuff that Anita and I have talked about, we have a whole series on this where we’re talking about the morning power routine and all sorts of other cool stuff. And we’ll link to that in the show notes, as well. So Anita, until next time, thank you. Anita: Thanks James, thanks for having me on. Fascinating. I have been on the fence about doing this. My mother was adopted so I don’t have any real history on her family/health issues. This pushed me over. I’m ordering this ASAP. Thanks for a totally unexpected podcast. Go for it Jon! Let us know what you discover if you are willing to share. I have another post coming soon when my next results come back… we go deeper down the rabbit hole. Good to hear we pushed you when you needed it Jon. Make sure you’re looking at symptoms in conjunction with your results. Thanks Anita and James, very interesting for us over 50’s too! Will be ordering my 23andMe asap! Hey you two. Great discussion. Thank you James for going totally on a side tangent with this stuff. Thumbs up. This is very interesting Anita. Just a few days ago I was on Andre´s site and signed up to his course http://listbuilding.io/ I really love his work. It´s full of passion and mastery. The topics you are discussing are an absolute passion of mine. I myself had to deal with a SNP called COMT and Amy Yasko´s book was totally lifechanging. I did some genetic testing already back in 2013 in San Diego when I was trying to find root causes for a serious health issue that I had. The interesting thing with the SNP that I have is actually that I have higher levels of dopamine compared to other people. I have a “shorter fuse” when under stress but when i´m in a “zen environment” my focus is like a laser beam. Ralph Waldo Emmerson Said “The first wealth is health.” It´s so true. I worked together with my wife on a startup in the Netherlands and one of my wife´s co-founders passed due to a stroke. It was such a tragedy. We often underestimate what wrong life style choices in regards to diet, sleep and exercise can have on us especially when we are in a high pressure environment like building a business or having a start-up. I was so happy when Andre posted his daily health routine on his resources page. You guys got it dialled.